You never know what you'll see when you're strolling through the 100-acre UC Davis Arboretum and Public Garden, a treasure to students, faculty, staff and visitors. 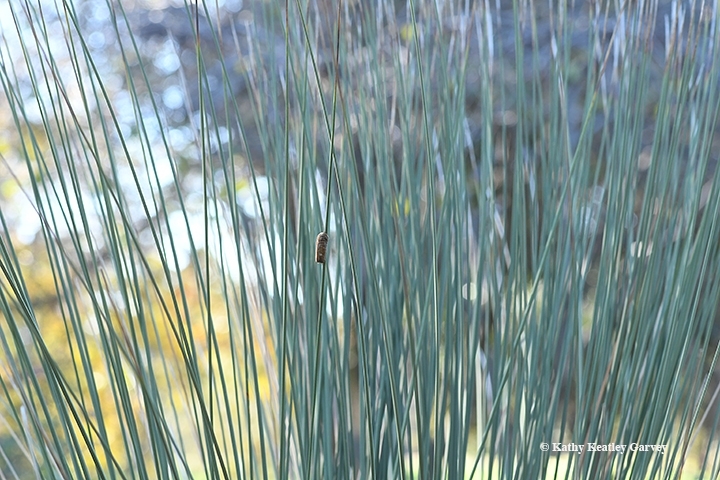 Case in point: For the last several months, we've been admiring a Mexican grass tree, Dasylirion longissimum, a 10-foot tall drought-tolerant plant with long, needle-like leaves radiating from its trunk. So perfect. So exquisite. Kinetic art at its finest. Indeed, it's often described as an "architectural wonder" in the plant world. Scores of horticulturists in California and the southwest United States favor it as their focal point for their xeriscape landscape projects. The plant is native to the Chihuahuan Desert, which extends from West Texas, through parts of New Mexico and Arizona, and into much of the central and northern portions of the Mexican Plateau. It can tower 15 feet in height. Last week we noticed something different about its presence in the UC Davis Arboretum: a brown clump clinging to the faded green wiry spikes. Could it be? It was. 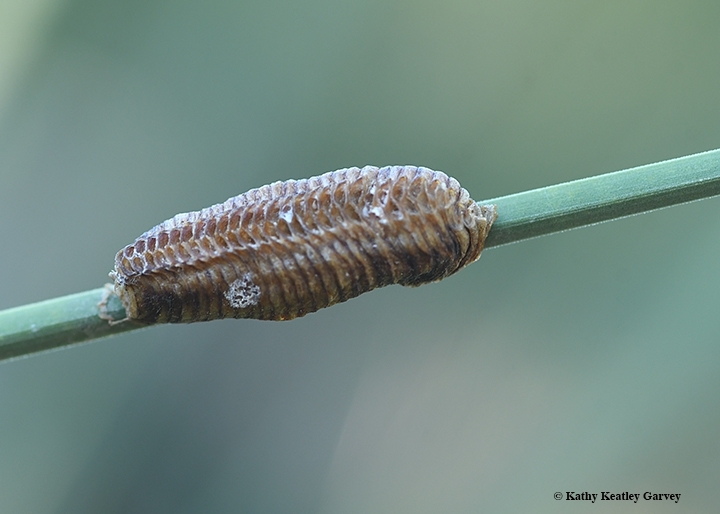 A praying mantis egg case or ootheca. To protect it from "egg gatherers," we won't indicate the exact location. 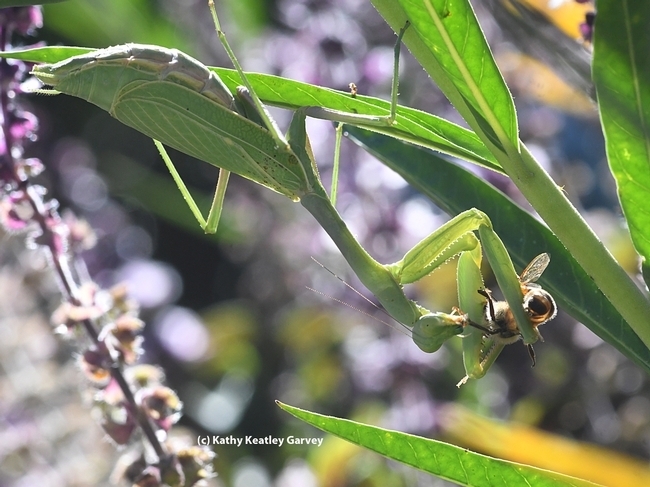 But it is clear evidence that a female praying mantis was there and she, no doubt, ambushed and devoured honey bees, syrphid flies and butterflies before mating and producing the egg case. Mantis expert Andrew Pfeifer, administrator of the popular Facebook page, "Mantis Keepers," says the ooth appears to be the work of a Stagmomantis limbata. California has only a handful of mantid species, Pfeifer says. The natives include Stagmomantis limbata, Stagmomantis californica and Litaneutria minor. Introduced ones: Mantis religiosa, Tenodera sinensis and Iris oratoria. “Typically you have pockets for native species where you see only one,” he says. We usually begin seeing sizable mantids around July and continuing through October. We photographed this one, a Stagmomantis limbata, perched on showy milkweed (Asclepias speciosa) on Oct. 3, 2017 in Vacaville, Calif., as she nailed unsuspecting prey. In this case, a honey bee.